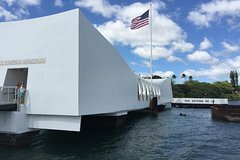 If visiting Pearl Harbor is on your must-do list while visiting Hawaii, this inter-island day trip from Maui to Oahu makes it easy. Round-trip airfare, ground transport and admission to the memorials are all included along with Pearl Harbor orientation by expert and a 35 minutes professional certified tour guide in Missouri as part pf small group. Get skip-the-line admission to the USS ‘Arizona’ Memorial and see the USS ‘Missouri’ Battleship, and more. Be sure to arrive at least 1.5 hours prior to your flight's departure from Maui to Oahu. You will fly out of the inter-island terminal and be greeted by a representative on arrival in Honolulu. After a brief orientation you are provided with vouchers and tickets to the attractions at Pearl Harbor. Once you're transferred by boat to the USS Arizona Memorial, there's no need to wait in line. Simply use your priority admission for fast-track entry and explore this top Hawaii visitor destination at your own pace. Stop by the Road to War museums and the Pearl Harbor Visitor Center to watch actual film footage of the 1941 Japanese attack on Pearl Harbor. Use another pass to transfer to Ford Island for a look at the USS Missouri Battleship. You have the option to either use an audio set for a self-guided tour or take a tour with a live professional certified tour guide on-site for 30 minutes. Before returning to the Honolulu airport to go back to the Maui you’ll visit a variety of Hawaiian heritage sites like Iolani Palace and the Statue of King Kamehameha, Hawaii state capital, Washington place and Punch bowl national cemetery. Inter-island flights, transfers to Pearl harbor and back to Honolulu airport, site entrance tickets, plus the Honolulu history drive through tour, are included. We also offering complimentary light breakfast and a Pearl Harbor lunch as part of this package. The tour concludes when your' dropped off at the airport for your flight back to the Big Island. Clients recieving a 75th anniversary of Pearl Harbor memorable MUG per reservation.